Many women are prescribed the birth control pill for their depression, mood swings, anxiety or PMS symptoms. Now new research from the University of Copenhagen has revealed that the birth control pill and other hormonal contraceptives (including the hormonal IUD, patch, and ring) could actually be causing depression for some women. The new study tracked over 1 million Danish women between the ages of 15 to 34 over the course of 13 years. None of the women had a history of depression, but upon starting with the birth control pill, hormonal IUD, patch or ring, developed depression at significant rates. The researchers found that women taking the combined (estrogen and progestin) pill were 23% more likely to be diagnosed with depression and those using progestin-only pills were 34% more likely. Teen girls were at the greatest risk, with an 80% increase when taking the combined pill, and a two-fold risk with the progestin-only pill. The other synthetic hormone-based methods were shown to increase depression at a rate that was even higher than either kind of pill, for all women. This is the largest scale, highest quality research study of its kind. These women were diagnosed with depression and/or prescribed antidepressants. I have seen countless times, women getting off of synthetic birth control find that they no longer need antidepressants. Often, for women, depression is related to our hormonal balance – as this new study only confirms. Adding synthetic hormones that block our body’s own production of hormones and replace the hormone cycle – it’s not all that surprising that taking hormonal birth control can cause depression. Perhaps you’ve experienced it for yourself. Antidepressants have, in themselves, been linked to infertility issues, which makes this protocol doubly problematic. What can we take away from this new research? I recommend avoiding hormonal birth control and instead using other methods of contraception. My personal favorite is condoms, but there’s also the diaphragm, cervical cap, and fertility awareness. If reading this new research has made you realize you do suffer with depression as a side effect of the hormonal birth control you are using, then you need to transition off this medication in a way that will help you to avoid any withdrawal symptoms. If you have depression and you realize that hormonal birth control is not a good treatment option (or you have depression and you’re not on hormonal birth control), I have some suggestions for natural remedies. 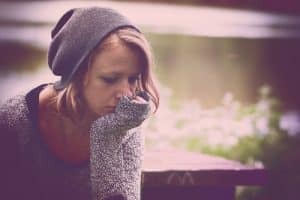 Many women suffer from depression as the result of a hormonal imbalance, micronutrient deficiency, or a gut health issue (or a combination of all three). B vitamins – the birth control pill depletes B vitamins and this is one of the mechanism by which it likely causes depression. There are plenty of studies to show the positive affect B vitamins can have on mood. You’ll need to take a daily B vitamin complex and additional B12 and B6. Probiotics – the birth control pill disrupts the microbiome and destroys gut health. Most of the serotonin (the happy hormone) our bodies make is created in the gut. When your gut flora is off-balance, you cannot absorb the necessary nutrients you need (including those B vitamins). More research is mounting to explain the gut-brain health connection. This is cutting edge information that will soon become common knowledge. Eat fermented foods like kimchi or sauerkraut daily. Omega 3 fatty acids – you can get your omega 3s from Evening Primrose Oil or Cod Liver Oil. Again, many studies show that increasing intake of omega 3s helps with depression and anxiety. There is an established link between depression and inflammation, and omega 3s are anti-inflammatory in action. You can supplement and increase foods like flax seeds, chia seeds, walnuts, salmon and oily fish like mackerel and sardines. Magnesium – the majority of us are deficient in magnesium. We need magnesium to produce healthy hormone levels. Magnesium is cortisol-regulating, meaning it’s actually physically calming to our stress-wired systems. It’s well-evidenced that magnesium can alleviate depressive symptoms. Exercise/movement – when you’re feeling depressed, working out might seem near-impossible. That’s why I suggest bodywork as an alternative – a good massage of any kind can be just as helpful. Many studies point to movement helping to alleviate depression. This doesn’t have to mean a spin class, it can mean a massage, or yoga, or stretches, or a simple dance break during your work day. Your body will still release those mood-boosting endorphins. First, do you have depression? Second, do you get PMS symptoms? What about the copper IUD? It is a non hormonal contraceptive. I would love to have your opinion on this option! I have started taking the pill for the first time (aged 29) a few months ago and as feared, it messed up a relatively good functioning system quite a bit. I have always had regular and fairly painless periods as a result of living a healthy, fit and independent life (with condoms being used as a contraceptive method of choice). I settled into a new life, in a new country, with a new partner, and soon after found myself in hospital with a ruptured ovarian cyst(s). This contributed to our choice for me to go on the pill, in an attempt to prevent the formation of cysts in the future. The biggest change that came with going on the pill is that I have become incredibly emotional, crying all the time for the smallest of reasons. My mind is unfocused (affecting my new job) and for the first time in my life, I could say I found myself feeling depressed and not myself. It has put unnecessary strain on my partner as well and therefore I seek help. I have read some women improved a similar situation by also adding testosterone supplements to their regime with great success. However, if I can achieve the same naturally with the food I eat, I would prefer this route and is therefore attracted to your approach and your program. I really need to take back control of my hormones to live a fulfilling life for myself and for my partner. How can I get access to a personalised evaluation and guidance?